Srinagar, February 18: In another setback for the forces in Jammu & Kashmir, at least four jawans were martyred in a fresh encounter which erupted in Pinglan area of Pulwama district. The exchange of fire was reported in the wee hours of the day, with TV reports confirming the casualties in the morning. Apart from the four Army personnel who have been killed, one jawan has been reportedly injured in the cross-firing. The identities of the victims are yet to be confirmed. However, one of the deceased has been reported to be a Major-rank officer, whereas, all of them are affiliated to the 55 Rashtriya Rifles. The injured soldier has been rushed to the nearest hospital for treatment. Pulwama Attack Fallout: PDP Office Sealed in Jammu by Kashmir Police Ahead of Mehbooba Mufti's Visit. By the time this report was published, the affiliations of the militants involved in the encounter could not be confirmed. However, local sources claimed that they belonged to the Hizbul Mujahideen. This marks the third incident within a week's span which has resulted into the loss of lives for the Indian forces. 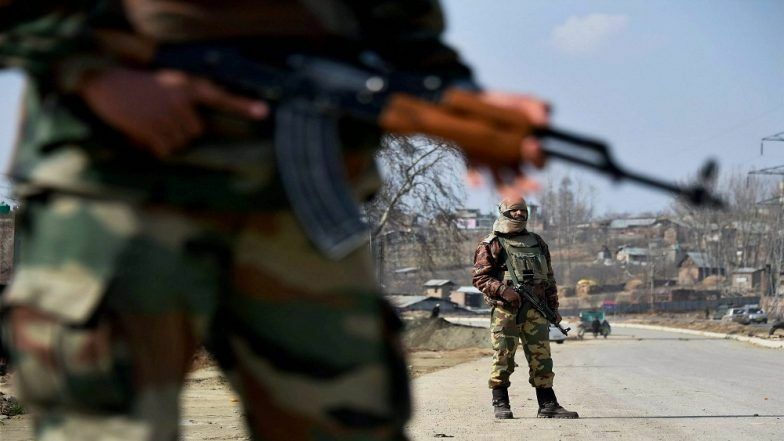 On February 14, a local militant affiliated to the Pakistan-based Jaish-e-Mohammad (JeM) carried out a fidayeen strike in Pulwama's Awantipora, which led to the death of 40 CRPF personnel. Two days later, on February 16, an Army Major was killed in an IED blast.